As of 2010, Gallup polling found that 31% of Americans identified as Democrats (tying a 22-year low), 29% as Republicans, and 38% as independents. Still, Democrats did and probably still do make up the largest voter block. 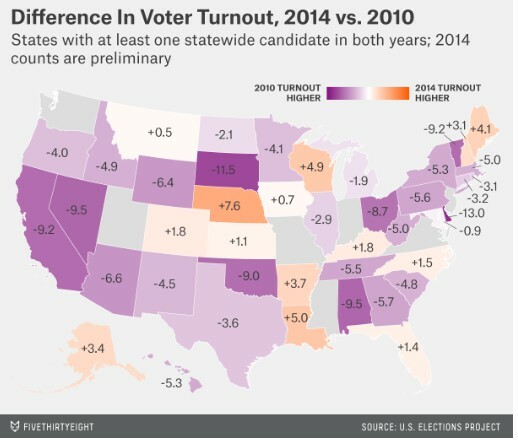 What happens when voter turnout is low is an obvious extension. When voter interest drops and voter apathy occurs, the Republicans win and they have proven that they can win BIG. They will make statements about how they represent the will of the people but that’s open to interpretation. If a Democratic voter doesn’t show up on election day, they should be prepared to be represented in the media and our legislatures as having switched party loyalty.